Marines are bringing equipment to Catalina Island in preparation for an innovative project to repair the main runway at the Island's only airport and train for deployments to islands and other remote destinations to build or repair airfields and other infrastructure. 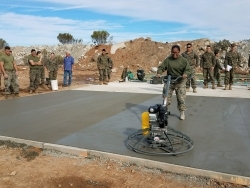 Avalon, CA, December 11, 2018 --(PR.com)-- The U.S. Marines and Navy will bring approximately 500 tons of equipment and tools to Catalina Island the week of December 17 to prepare for the January arrival of over 100 Marines and Navy Seabees who will repair the aging main runway at the Catalina Island Conservancy’s Airport in the Sky. "The Catalina Island Conservancy’s Airport in the Sky presents a unique training opportunity for Marines and Sailors to conduct relevant, real-world training while providing a service to our local community," said 2nd Lieutenant Zachary Bodner, a 3rd Marine Aircraft Wing (3rd MAW) spokesman. Formed in 1972, the Catalina Island Conservancy is one of California's oldest land trusts. Its mission is to be a responsible steward of its lands through a balance of conservation, education and recreation. Through its ongoing efforts, the Conservancy protects the magnificent natural and cultural heritage of Santa Catalina Island, stewarding approximately 42,000 acres of land and more than 60 miles of rugged shoreline. It provides access to the Island’s wildlands and 50 miles of biking and nearly 165 miles of hiking opportunities within its road and trail system. The Conservancy conducts educational outreach through two nature centers, its Wrigley Memorial & Botanic Garden and guided experiences in the Island’s rugged interior. Twenty miles from the mainland, the Island is a treasure trove of historical and archaeological sites. It also contains numerous rare and endangered animals and plants. The Island is home to 60 species – and counting – that are found only on Catalina. For additional information, please visit www.catalinaconservancy.org.